Day Dental is pleased to offer Innisfail Invisalign Invisible Braces to correct misaligned and crooked teeth. Invisalign – It’s the virtually invisible way to straighten your teeth without braces. Invisalign Invisible Braces are a clear alternative to conventional braces for patients as young as 13 years old and for those young at heart. Conventional orthodontic methods straighten your teeth using appliances and wire braces — and both have a reputation for being uncomfortable and unattractive. Traditional wire braces are hard to clean because food becomes trapped in the brackets and wires. Plaque also accumulates around the brackets and can lead to irreversible discoloration and tooth decay. 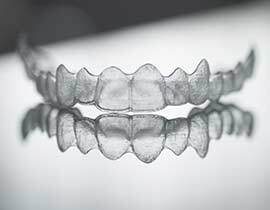 The Invisalign system uses a series of clear, removable aligners to move your teeth into alignment gradually. Invisalign makes to easy for you to brush and floss your teeth throughout your treatment and our patients love eating all of their favourite foods during treatment thanks to the removable aligners. Teeth with crowding make it hard to brush and floss correctly and can lead to plaque accumulation, tooth decay and an increased chance of gum disease and, of course, the teeth look crooked. Too much space in between the teeth can often be treated using Invisalign. The spacing between teeth not only looks unattractive but can lead to concerns with the gum tissue such as periodontal pockets that can accumulate plaque and an increased risk of periodontal disease. Crossbite means that the top and bottom jaws are not aligned correctly. This can lead to abnormal wear on the teeth in the form of chipping, and cracks and periodontal problems including gum disease and bone loss. Again, Invisalign is an option for crossbite, depending on your situation. Dr. Isaac Day and Dr. Jacob Day are Certified Invisalign Providers and have extensive experience with Invisalign treatment for both adults and teens. If you would like to learn more about Innisfail Invisalign Invisible Braces, book your consultation appointment with Dr. Isaac Day and Dr. Jacob Day today!